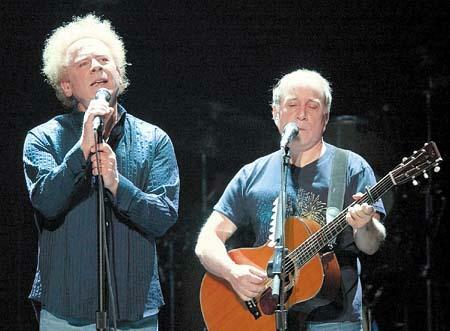 Simon & Garfunkel kicked off their 2009 tour in Auckland New Zealand last weekend, and the author and his wife were fortunate enough to be there. The second of two sell-out shows had four standing ovations. The duo performed from 8PM to past 10PM without an intermission. The two did take turns doing solo time on the stage to perform songs from their time apart. They were visibly moved by the audience’s enthusiasm. The concert was held at the Vector Stadium in downtown Auckland. I had to pinch myself, to make sure I was really seeing and hearing them in person. These iconic performers and songwriters of course played America, Kathy’s Song, Homeward Bound, The Boxer, Bridge over Troubled Water, The Sound of Silence and Mrs. Robinson. Their contribution to a generation’s values and foresight is significant, but you’d never know it seeing them on stage. They were as humble as the local musician on a street corner. This entry was posted on 18/06/2009 at 04:54 and is filed under Inspirational People, Leadership, Music, New Zealand, Spiritual. You can follow any responses to this entry through the RSS 2.0 feed. You can leave a response, or trackback from your own site.